The second week of February 2010 will see Boston in a tumult of activity over the Together Festival, New England’s first electronic music festival. Nighttime events held all over the city having a common cause: dancing and music. 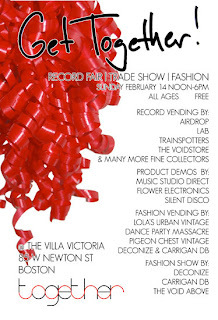 One of the most unique events, saved for last, falls on Valentine’s Day and will have people running to the beautiful converted church that is the Villa Victoria. The Get Together will be a multi-level record expo bringing music lovers together to buy, sell and share their much-loved collections. 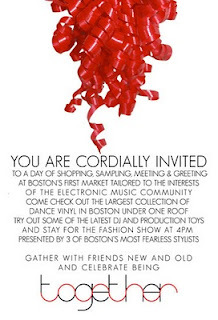 Boston's most beloved DJs will be providing fresh and classic tunes all day while professional vendors demonstrate the latest in DJ and production technology. What’s more, in the spirit of the remix, a fashion show will be held, whereby Deconize, Carrigan dB and The Void Above, three of Boston's most groundbreaking local stylists will combine vintage, refurbished and new accoutrements from all eras to create theatrical, avant-garde looks that will literally be danced across the raised stage. Iconic styles will be transformed, many vintage pieces will undergo exquisite re-design, and in the spirit of a spectacular 1990’s Thierry Mugler fashion show, the models will dance and play to the music. Hundreds of people will attend this event, and the potential to buy, sell, meet and share is huge. If you have a significant other, there couldn't be a better daytime activity for the electronically-inclined! If you're single, what better place find love than digging through stacks and racks? This event is all about celebrating dance culture and our electronic lifestyle; we hope to see you there! Don't miss the Silent Disco Party Train through the South End departing from the Villa Victoria at 6pm! This is your chance to literally dance in the streets as the Silent Disco team use their unique wireless headphone technology to lead a posse of revelers on a mobile pub-crawl rager. Sign up to reserve your slot at the Silent Storm Sound System booth at the Get Together! Space is limited and sign-ups will be first come, first served.